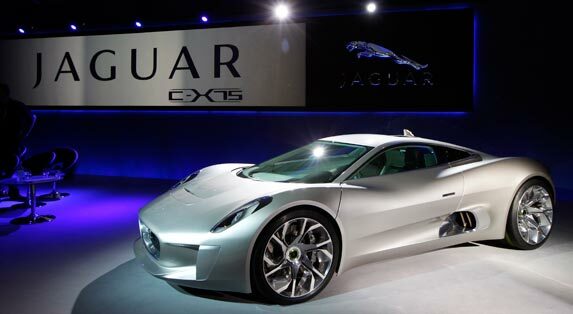 Jaguar C-X75 will become the British marque’s most advanced model to date. It will offer performance on a par with the fastest production cars on the market, while adopting cutting-edge technology that offers remarkably economical running. Jaguar expects this hybrid supercar to deliver incredibly low CO2 emissions of less than 99g/km while being able to achieve in excess of 200mph. Project C-X75 will be the ultimate expression of Jaguar design and engineering innovation. This high-performance hybrid supercar will stay true to the initial concept design study that made its debut at the 2010 Paris motor show, while fulfilling requirements that allow it to be homologated for road use. It also marks a new milestone in both company’s histories as Jaguar Land Rover and Williams collaborate for the first time to produce one of the world’s highest performance and environmentally sustainable supercars. The production of Jaguar C-X75 will create more than one hundred highly-skilled jobs in the UK. To bring Project C-X75 to showroom reality within the timescales of a conventional model programme, an equally innovative powertrain had to be developed. The road-going supercar will use a state-of-the-art, small-capacity, highly-boosted internal combustion engine with one powerful electric motor at each axle. fastest production cars in the world, with a sub-three second 0-60mph time and a top speed in excess of 200mph. Crucially, this performance will be generated alongside incredibly low emissions, with a target of less than 99g/km CO2, thanks to Project C-X75’s lightweight construction and cutting-edge powertrain technology. Jaguar C-X75 will redefine the customer experience, and will set new standards in sales and after-sales services that will be recreated across the range in the future. Only 250 examples will be built, each costing between £700,000 – £900,000 depending on market and local taxes.